This recipe is a good source of fiber, which may help protect you against some diseases. 1. In medium bowl, mix oats, yogurt, milk and salt. 2. Cover and refrigerate for 6-12 hours. 3. Add dried and fresh fruit, and mix gently. 5. Refrigerate leftovers within 2-3 hours. 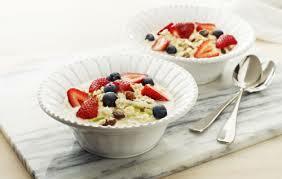 • Muesli makes a delicious breakfast. Try drizzling with milk. • Flavor boosters: cinnamon, grated orange peel.